CommonWealth reports the Herald's hedge-fund owners are laying off four ad-layout workers, two reporters and at least one person in IT. The ad jobs, at least, are being outsourced to Michigan. Also, the paper has started a paywall for its Web site. The New York Post reports the hedge fund that is now bleeding the Herald dry is looking to sell all its newspapers to Gannett (best known around here as the owner of USA Today). On a 1-10 scale, local media observer Dan Kennedy rates this deal as a 5.1 for the Herald, because it's not as if Gannett hasn't been squeezing its properties, either. Herald shrinks even more; soon to be published as a pamphlet? Another round of layoffs at the tabloidette today, including Boston's best spot-news photographer, Mark Garfinkel (who'd been at the Herald for 25 years). CommonWealth surveys the latest damage to the once feisty tabloid. At one point the Herald encompassed two floors - now advertising and editorial are separated by a little more than 77 inches of carpet. John Carroll provides the evidence. Dan Kennedy posts the memo from a manager with the Purcell regime to staffers about what happens at midnight tonight; Kennedy adds one of those not making the transition to Digital First Media is editorial-page editor Rachelle Cohen. The Boston Business Journal reports the new owners will shift Herald printing from the Globe in Taunton to GateHouse Media in Providence. 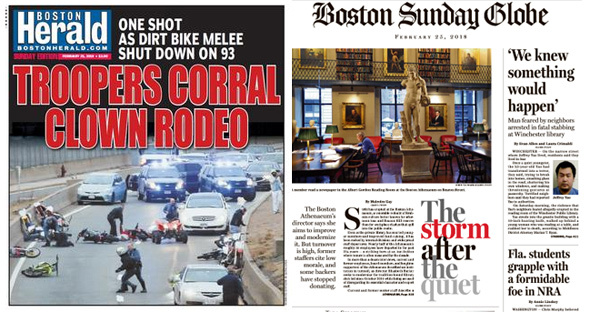 The way Boston's two major dailies covered yesterday's I-93 showdown between stunters and staties could not have been more different. Read more. The Herald reports that its new owner will be Digital First Media, a company that likes to make reporters work out of their houses rather than paying for an actual newsroom. The company bid $11.9 million for the paper in a bankruptcy auction. Adam Smith, who started as an editorial assistant at the Herald, hopes it gets a chance. 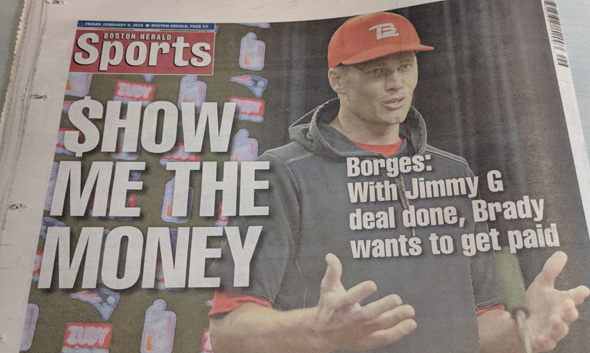 Ron Borges won't be writing any columns for the Herald pending further review after the paper had to pull his column today, the one about Tom Brady threatening a tantrum unless he got paid like Jimmy Garoppolo, because it turns out his source was a WEEI caller pretending to be Brady's agent in a text message. Or as the Herald put it: Read more. 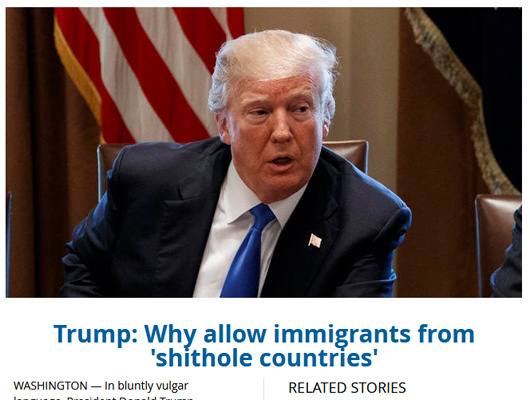 As word spread that our racist shitholer-in-chief insulted Haiti and Haitian immigrants, our local dailies had to decide how to describe the word salad being tossed in Washington. Read more. The Herald self-reports that owner Pat Purcell pulled out nearly $1 million in annual pay from the troubled tabloid - as well as payments for a golf-club membership - as the paper spiraled towards bankruptcy. John Carroll ponders coffee, selling for $10.99 a bag, that features Howie Carr's rictus on the front. The Herald's bankruptcy filing reports that among the debts the paper owes is an estimated $600,000 to the Boston Globe for "trade services," i.e., the cost of printing the Herald on its Taunton printing presses. Read more.